This item has gone from a "wish item" to a "gear review" in a mere two years! For "The Ukrainian's" birthday in July, I decided to order him an Endurance Bag. He had mentioned that he was thinking about a new gym bag. I saw him looking at some as we were shopping together. 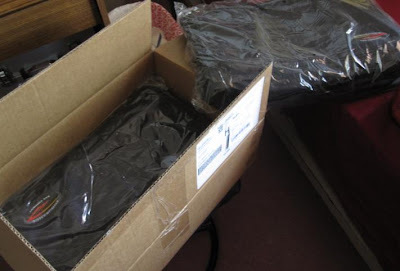 As luck would have it, the Endurance Bag warehouse was closing for the summer, so I got free shipping. However, this compelled me to get a bag of my own. So given the size and weight of this package, it was a savings! So here's a picture of my packed Endurance Bag. Mine is black, while "The Ukrainian" got his in midnight blue. The first shock is the size of the bag. Certainly, it shipped small but pops out BIG. It barely squeezed into my locker at the gym. But notably, it has a TON of compartments. Now, I can keep my shower stuff, shoes, towels, iPod, and everything else separate from each other. I can pack multiple days' worth of gym clothes without worry. 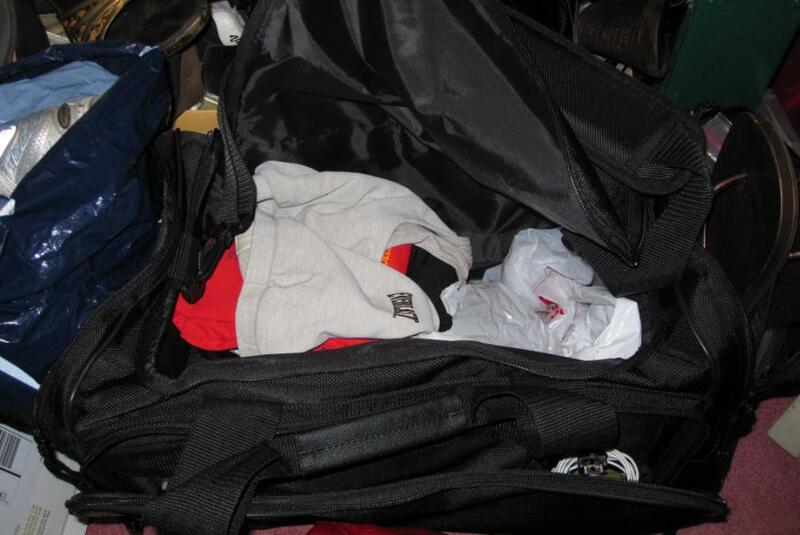 And there's still compartments I haven't packed anything into yet because I don't have that much stuff! This would make a good race travel bag, as they noted on their own website. If there is one downside to this bag, it's the weight. Boy, is it heavy, or maybe I am just weak. "The Ukrainian" thinks his isn't as heavy as his older bag. What?! At any rate, these bags were efficient enough to take both of us on a four-day vacation, so really, the weight is nothing! I waited for months for "The Ukrainian" to give his review of this product, but I'll say that it is similar to mine! Though I really have more bags than I need and refuse to switch any before they are deathly tattered, this bag has been coming up every now and then as I surf the net. 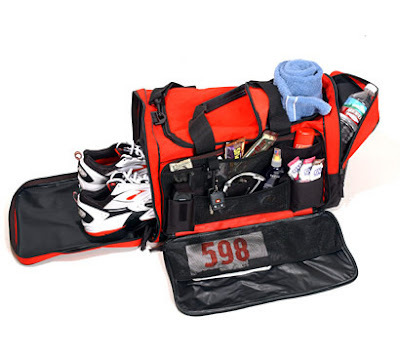 This is the Endurance Bag, meant to carry all a marathoner's junk. For me, this would include wallet, shower sandals, work badge, shoes, pain patches/spray, sport bandage, regular bandages, jumprope, contact lens solution, glasses, concealer, eye shadow, lip lacquer, eyeliner, Aquaphor, extra hair ties, iPod, Nike+ sensor, showering stuff, mace, USB drive, running clothes, socks, change of underwear, shower wipes, textbooks, etc. etc. Yes, I feel sorry for any bag that becomes mine. I am not sure if this bag would stand up to my rough-housing. I tend to smash my huge, non-rectangular bag in the small locker at the gym at work, which has damaged it over time. I would also need a bag that was decently fashionable. My current one is black so not too glaringly bright when I take it to work. Anyway, I just wanted to spread the word about this bag. I'm sure it will make a lot of runners/other athletes very happy.